SERIOUSLY…this is the very best. And don’t be shy about trying it cold right from the fridge the next day (if there’s any left). 1- Peel and cut apples about ¼ inch thick and squeeze a splash of bourbon or brandy or the juice of half a lemon. 2- In a large bowl, combine the apples, and all other above ingredients. Mix well with your hands or a rubber spatula and let rest for 30 minutes or up to an hour. The apples will release juice that will enhance the flavor of the crisp and also allow the apples to cook better. 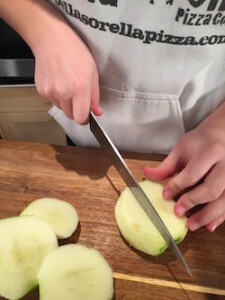 3- Make the topping while the apples macerate. 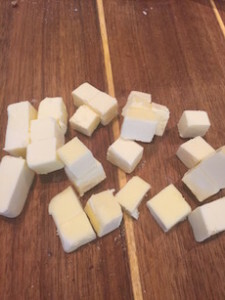 ¼ pound cold butter, cut into 1/2″ cubes to break them up a little. Add all other ingredients except butter. Pulse again to combine. 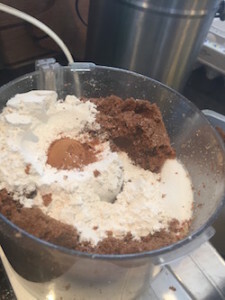 NOTE: If you don’t have a food processor, you can do this in a bowl and, when adding the butter, use two forks or a pastry blender. 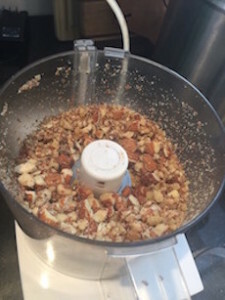 5- Add butter and pulse until the nuts are 1/4″pieces or smaller and the whole mass has come together in a loose ball. 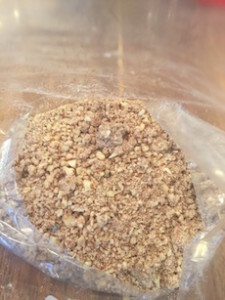 Pulse enough that the mass still has chunks of butter but do not turn the nuts into dust. At this point, you could freeze the topping. 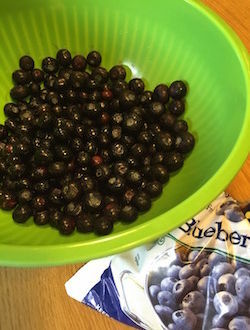 You can double the recipe and save half in the freezer for a quick dessert later. 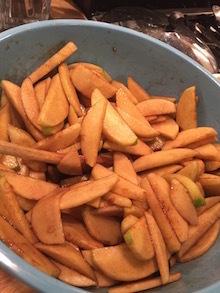 6– Give the apples a stir to distribute all those juices evenly and pour them into a baking dish. 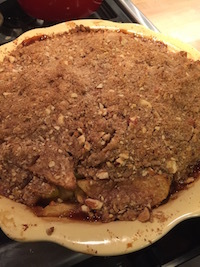 It’s best if the apples are mounded up above the top of the dish. They will sink as they cook. 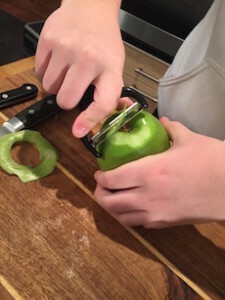 7- Distribute the topping over the apples, using your hands to break up the clumps. 8- Place the dish on a baking pan (to catch juices that will drip over as it bakes) and into a preheated 375-degree oven. Bake for 45 mins-1 hr. and turn two-three times while cooking. 9- Check the crisp. You will know it’s done when the juices are bubbling thickly all around and the topping is a deep brown. Also the whole thing will look as if it’s settled down into the dish. 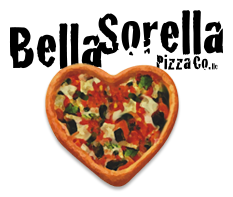 10- Do not be afraid of browning the topping. Many people fear burning their baked goods, but brown means flavor. If you think it is in danger of burning before the apples are cooked, you can lightly cover the dish with foil. 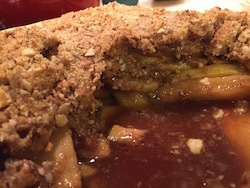 Deep dark toasty topping and completely cooked, juicy apples is what we want. LOOK for tiny bubbles all around the edges of the crisp. 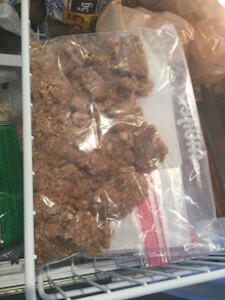 11- Let the crisp cool for 20-30 minutes at least before serving. It will stay warm for a long time. 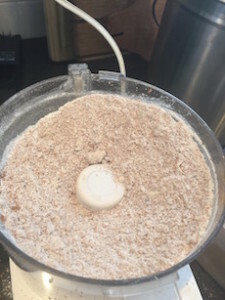 12- Serve it with ice cream (oh yeah), whipped cream, sour cream, creme fraiche, or even just a little plain cold cream poured over. 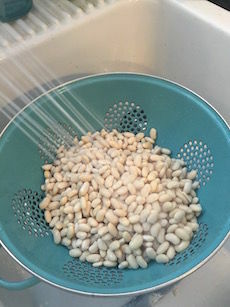 – If you want to transport this to take to a party or something, wrap it in a clean dishtowel to allow steam to escape and keep the topping crispy. 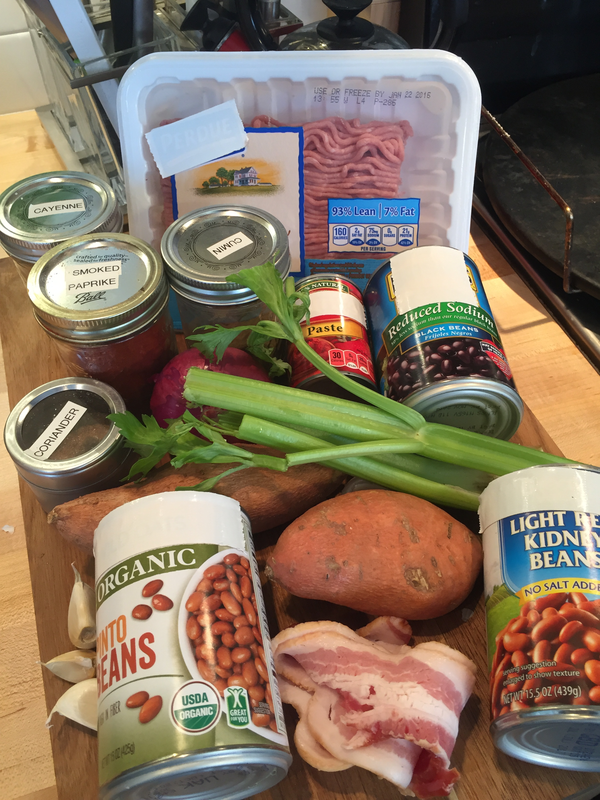 – What’s great about this recipe is the variations. Use another fruit (pears or quinces) in combination or in place of apples. Add dried fruits (raisins, cherries, apricots) that have been re hydrated in water, juice, or wine. 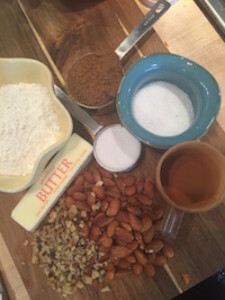 Use different nuts; whatever you prefer or have on hand. PLEASE comment on our You Tube page if you try this recipe. Let us know how it goes!